So Taobao is like really AMAZING. Ever since I started about 3-4 years back, I've been addicted to it on and off.. I've gotten many things from Taobao, ranging from stuff for our wedding (like artificial flowers for our bridesmaid to hair accessories), to baking stuff... to clothes.. and even furniture. More often than not, Taobao offers items that are cheaper than what's sold in Singapore. 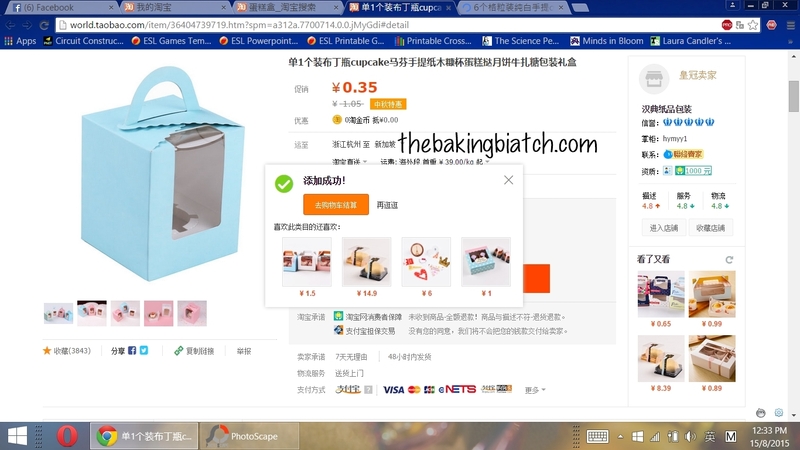 Also, Taobao offers things that cannot be found in Singapore, like pretty cake boxes. What I'm sharing is what I'd call direct shipping.. This applies to using Taobao's appointed forwarders to bring items in by air. This bypasses the need for an agent. This is generally applicable to items you need soon (as opposed to sea shipping which can take weeks) or items that are light and those that do not exceed the limit for length.. For bulky items, I'd recommend agents (which I'll explain down the road).. So you'd first need to get started by setting up an account! Generally, you'd more or less need to be able to read a little mandarin or use Google Translate to play around a bit..
As this blog post is INSANELY long, click on to read more! 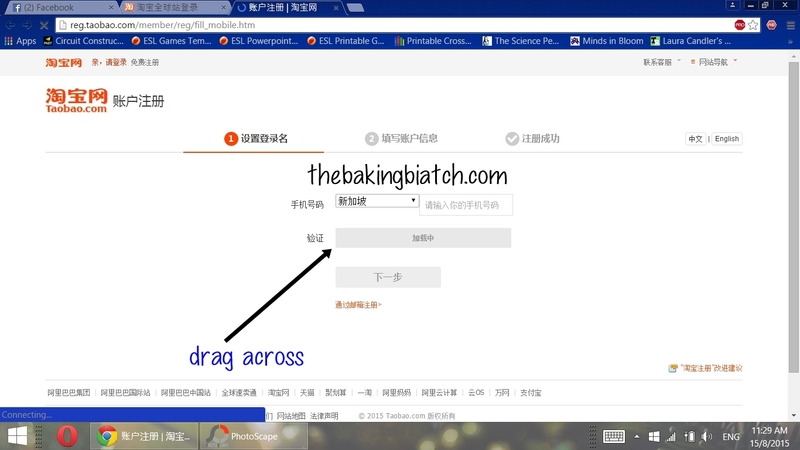 Head over to www.taobao.com and click on the link below the orange box. Choose Singapore (新加坡) for the country. Drag the bar across for verification purposes. You'd be prompted to accept terms & conditions. Key in your mobile number as required. 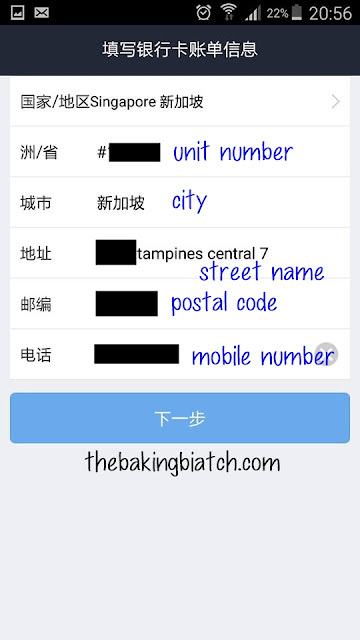 Type in the 8 digit local number. Sms-es will be sent to this number. 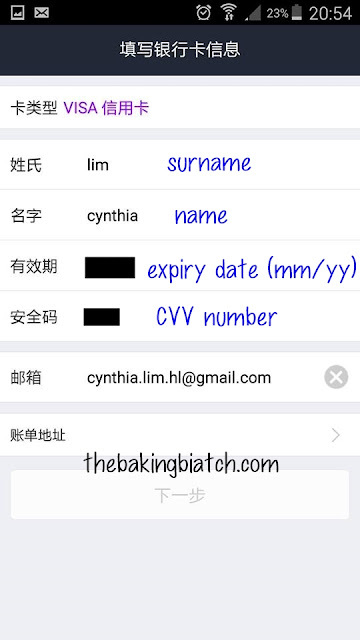 A verification code will then be sent to your phone.. Key it into the box provided. 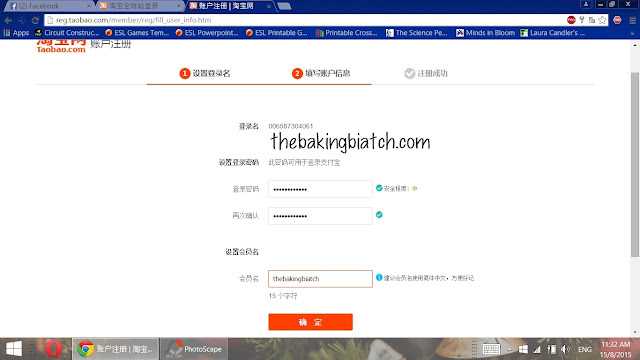 Set up your password and choose a username. Log in! Please do make an effort to REMEMBER your passwords. 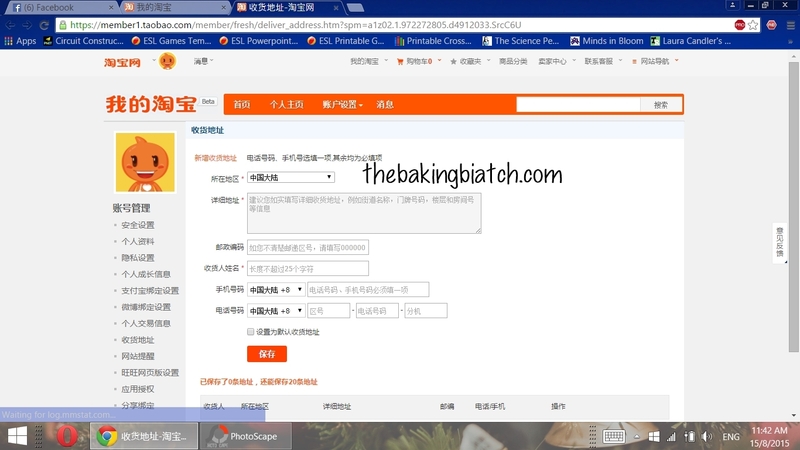 It's a pain in the a*s to do verifications for taobao. 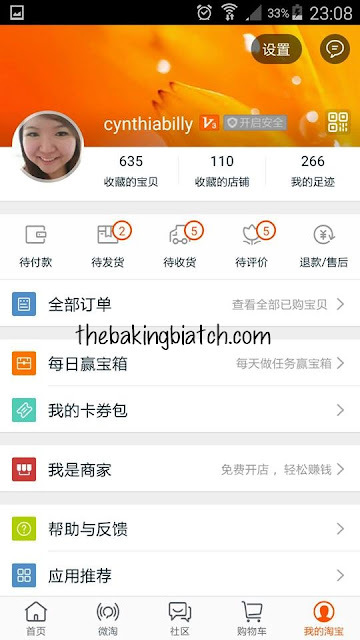 Go into your account and choose 我的淘宝. Click to edit your address. This is what you'll see.. Input your data in this format.. and with that, you're good to go!!!!! Now, with taobao, I believe in using both the PC version as well as the Taobao app. Personally, I feel that the PC version is good for payment (especially e-nets) and important transactions while the mobile 淘宝 mobile application is the best shopping companion. I usually surf and cart things using my phone and pay using the desktop. Of course, you'd be able to surf and source for things using keywords using the desktop version. A general rule would be that you'd need mandarin words to get good search results. 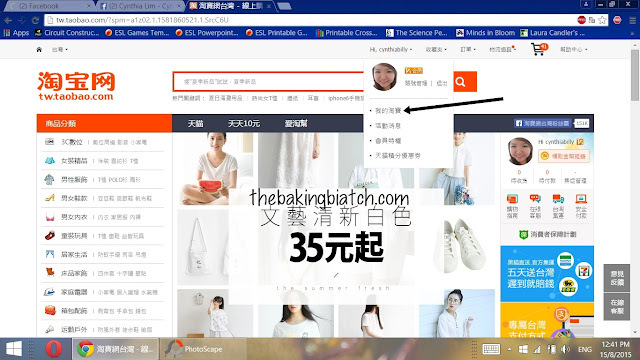 Even though you can do your searches in English, results will be limited (more often than not) as Taobao is a Chinese site after all. You can use Google Translate to help you translate. Using Google Chrome with the in-built translator works too. Google Translate isn't perfect though.. so do play around with the keywords. For example, to source for cake boxes I'd search for 蛋糕盒. 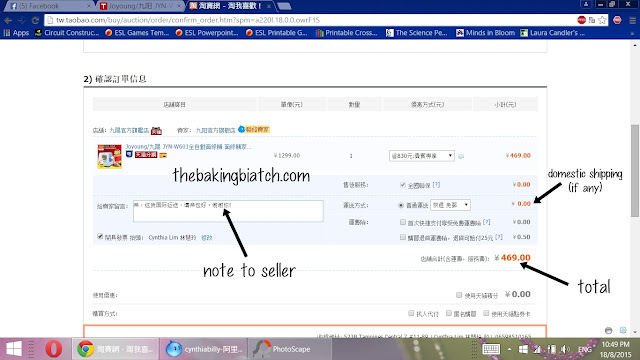 The arrow indicates the number of sales for that month.. Generally, I'd go for sellers with a higher number of sales.. 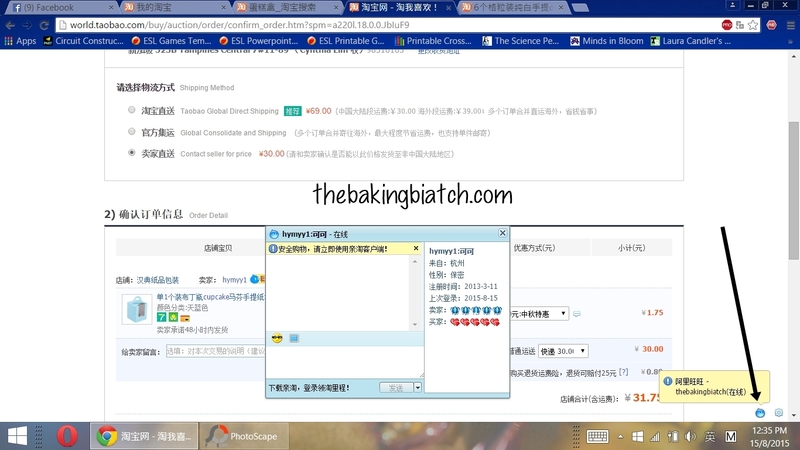 The blue icon would indicate that the seller is online and good for chatting via their chat programme 阿里旺旺 (ALWW). A grey one would indicate that the seller is offline. 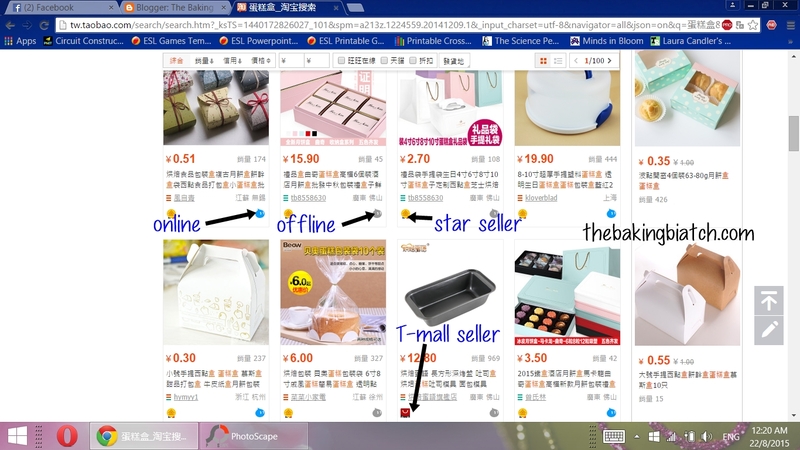 Sellers with the gold icon are those who are more frequented and reliable. Those with a red paper bag with a black cat are T-mall sellers. It means that these sellers have a physical retail store in China. Sometimes this would mean that they're more reliable.. but I've also come across crappy T-mall sellers. Which brings me to my main point. Online shopping is all about risk taking. No one can guarantee you that the items are gonna be of good quality. No one can guarantee you that it's cheaper to get things online (you'd need to do your research)... Generally, of say.. 30 things that I buy, 1 isn't of standard or up to standard. But of course, one has to discern if an item is worth buying or if the quality is good.. If you're still apprehensive, brick and motar shops might be your thing. As a general rule of thumb, this is how the layout of each page is like.. You'd be able to figure out the item price, stocks available, product options, quantity and the ability to add to your cart. Add the item to cart! So if you have like 60 items, you'd need to check out your cart twice. If you have like items from 25 sellers, you'd need to check out your cart twice too. Which brings me to the next point, every PACKAGE by the forwarders will only take 20 parcels from sellers (from 20 sellers). If you have stuff from 25 sellers, you'd likely have 25 parcels. That way, you'd need to consolidate your parcels into 2 PACKAGES as each PACKAGE can only have 20 parcels. There is also a weight restriction of 30kg (if I didn't remember wrongly) and does not exceed length/breadth of 120cm. When checking out, click on the items you wish to pay for. There are a few types of shipping.. The first one being direct (from seller) straight to your place. This bypasses the consolidation stage. Items are sent from seller to the appointed forwarder and straight to your place. The shipping is calculated (not sure what it's based on.. item weight perhaps) and you can pay for it.. The second one being the use of one of Taobao's appointed forwarders. My favourite will have to be 4px. Even though they're the costliest, it's definitely money worth spending. This is the forwarder I often use to bring my goods into Singapore. You can either download the ALWW app for chatting with the sellers or use the browser version. After you've chosen your preferred shipping company/method, you're good to pay! The item's domestic shipping will be calculated and showed here. Many sellers do 包邮, meaning that domestic shipping is free. Some have it with any purchase, some with specific purchase while some are given free when a certain amount is spent in the shop. You'd also be able to see your final amount and likely be prompted to verify your payment with one of those 'spot the characters in the box' thing. 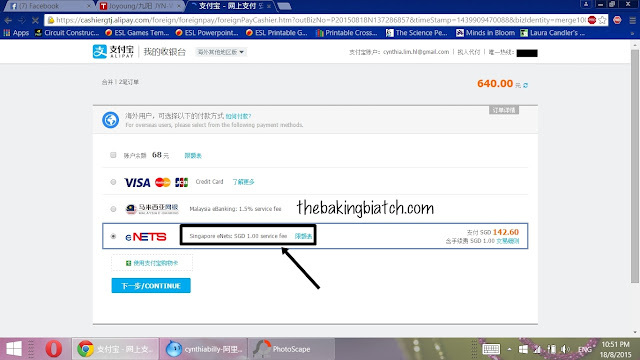 During your very first payment, you'd be prompted to set up your Alipay account. This is like your wallet. The password has to be different from that of your taobao account (for security reasons). DO NOT EVER EVER EVER forget this password. Like NEVER EVER. You'd have hell trying to verify your account.. Seriously, too many people just 'forget' their passwords here. Choose a good password and commit it to memory. Or just jot it down somewhere. Payment can be made via several modes.. the most favourable one in my opinion is via eNets. For every eNets transaction, you're only billed SGD$1 and the rates are pegged to live rates. CC rates are lower and there is a 3% service charge per transaction. 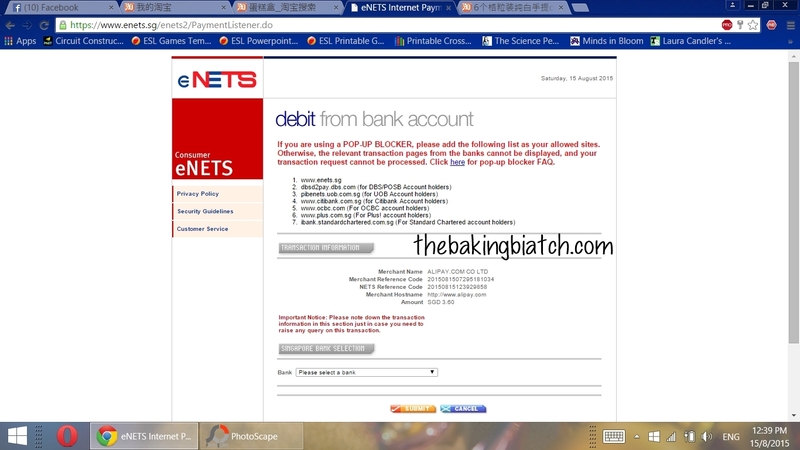 Generally, for any payment above $30, just use eNets. Oh yes, you'd need a iBanking account with any of our local banks for it. 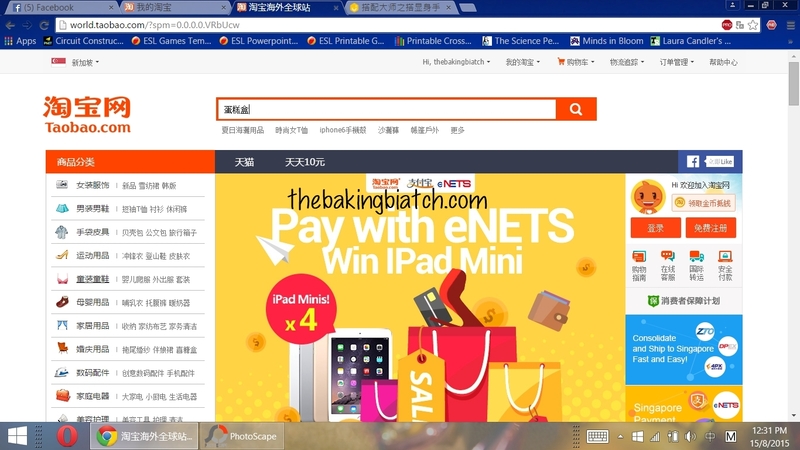 As of September 2016, eNets is no longer supported by Taobao. BOOOOO HOOOO! However, fret not. You can still make your payment via your credit cards. Some may lament that the lower rates and 3% credit card charges are costly.. but think about it.. if the item is STILL CHEAPER than what you'd pay in Singapore, that itself is SAVINGS earned. It's very convenient anyway! The other way round it is to purchase Alipay cards with stored value at a LIVE rate available at the point of purchase. I have heard of it being unavailable of late due to high demand.. I still shop, and for me, credit cards are my way to go. To calculate the live rate, take a dollar off your SGD amount and work out the math. For example, 11.75rmb / (3.60 - 1) = 4.519... that was the live rate for this payment.. 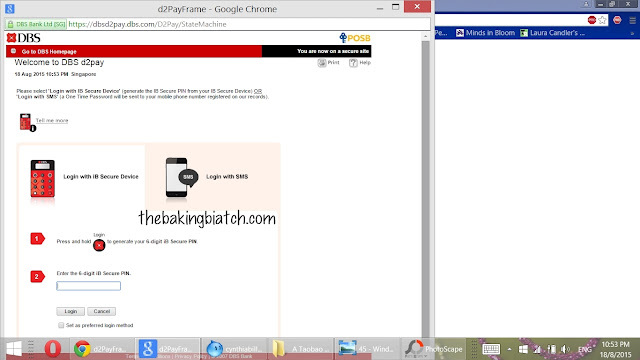 Ensure that your pop-up windows are enabled.. you'd then be able to choose the bank.. I use DBS/POSB so I was guided to enter my ibanking pin..
Once you're done with your order, you'd just have to wait for the seller to ship the items (anything from immediately [for real, they have mad efficiency] to 5 days)... once your items reach your forwarder's warehouse, you can consolidate your PACKAGE and ship it out to Singapore. Earlier this week, I tried out the direct shipping that bypasses the consolidation stage.. There was no domestic shipping for the noodle machine I got.. The rate was 4.51 then.. (I miss the days when it was 4.9!) After paying for the item, you'd be able to view the details in your account. You'd also be able to see how much you paid for that particular order.. If you use the mobile app, you'd be able to track the items. I usually track my items via the mobile app. Here, I'm told that my parcel has been shipped out. I can even track the exact (well, almost) location of the parcel. For example, I checked out a new backpack.. I'm also able to leave a message/note for the seller. I had some accumulated discount so I used it! As such, I'm left with a bill of rmb 30.32. 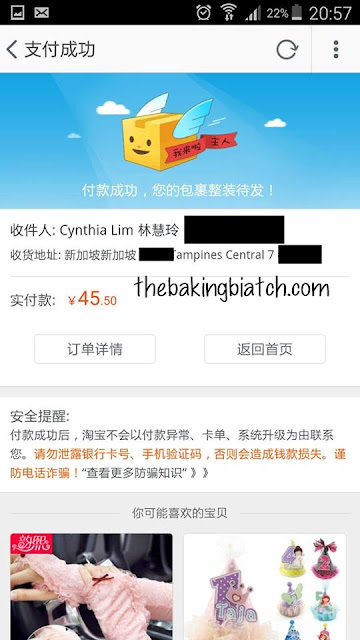 I had money left in my Alipay (e-wallet) from a refund from a previous transaction. 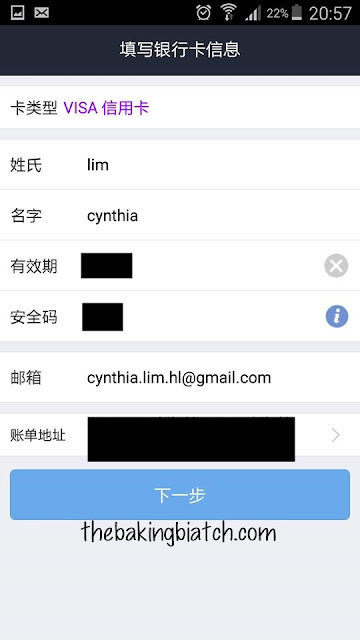 As such, I had to log in using my Alipay password (The SUPER IMPORTANT that should not be forgotten) to authorise the deduction. 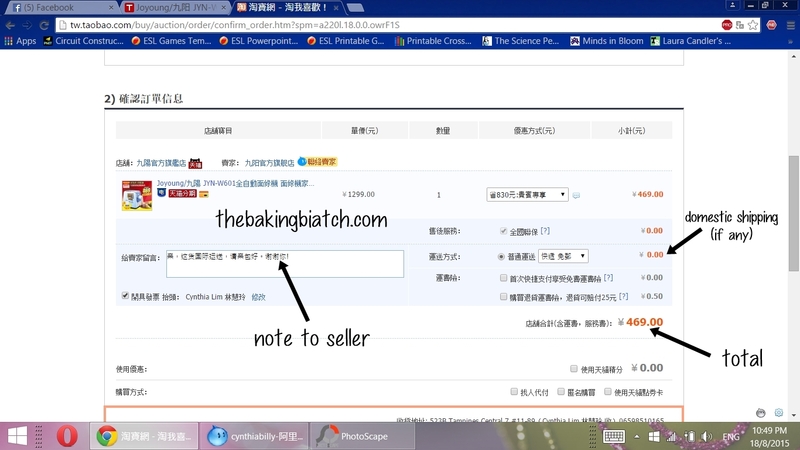 If sellers make refunds to you for whatever reasons, they can do so by depositing it to your Alipay. Your credits are then held for you till you use it. If you're using credit cards for payment, the funds go back to your cards. That's pretty hassle-free! And my order was placed! The order details such as order number is easily found.. 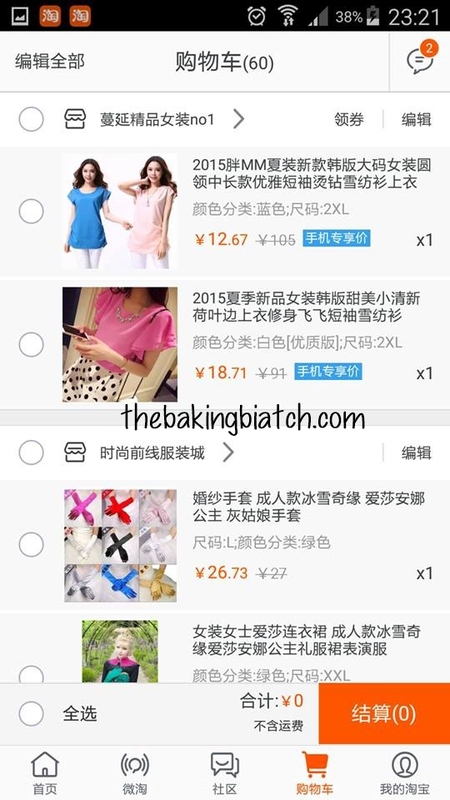 It is easy to shop on the taobao app.. you can view the sizes and options easily.. It is easy to view item details too.. The only peeve I have is that I cannot remove items from the cart via the mobile app..
You may do so via the edit button next to the shop's name. Otherwise, the app is awesome. Usually, when I buy items, I'd ask the seller to pack it well.. So I'd leave notes for the seller or ALWW them..
For packages with multiple items, I'd request for them to pack it all together... lest the seller dispatches several packages.. 亲你好，请你帮我把货都包进一个包。谢谢你! Of course, my Mandarin is only half past 6.. If you can phrase it better, do it! Once you're in, key in your 16 digit card number. They WILL NOT remember it for you.. which is good. In the last row, you'd be prompted to key in your address too. Do so in this format..
Once you've done so, you're good to go! You'd be charged an additional 3% service charge..
And as your payment is completed, you'd just have to wait for the items to reach you at your doorstep! You can track your items on your mobile app as well as desktop.. Here's what you will see on an order when the item has reaches the warehouse..
Click on the blue option to consolidate your parcels..
You'd also see a countdown timer. 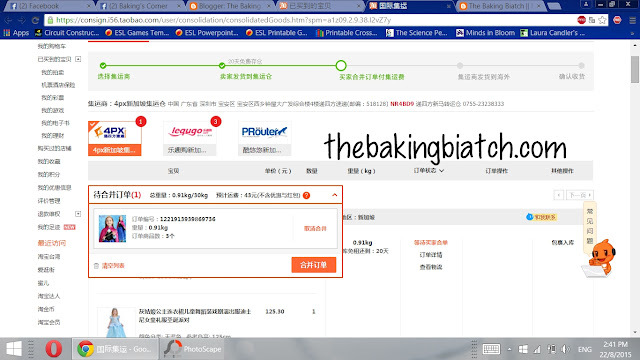 Taobao gives us 10 days to for items to reach us and after 10 days, the $ will automatically be credited to the seller. This can be extended by a day or two but I don't bother with it.. If my items do reach me before the 10 days is up, I will click to release the payment to the seller (using Alipay password). But even if I don't, the system will auto-release the money when the timer is up. The number of days that your order takes to be completed depends on many factors.. It is possible for an item to reach me in under 10 days.. (: At times, I'd check if the seller can ship out the items the day I order.. and consolidate as soon as all my items are in the warehouse.. The warehouses store items for a free 20 day period. Should you pass that duration, each item per day will cost you a small fee. When you click on the blue button to consolidate your parcels, you'd be taken to this screen.. Click on the orange button to add to PACKAGE. You'd see the number of days of 'free' storage you have left for each package. 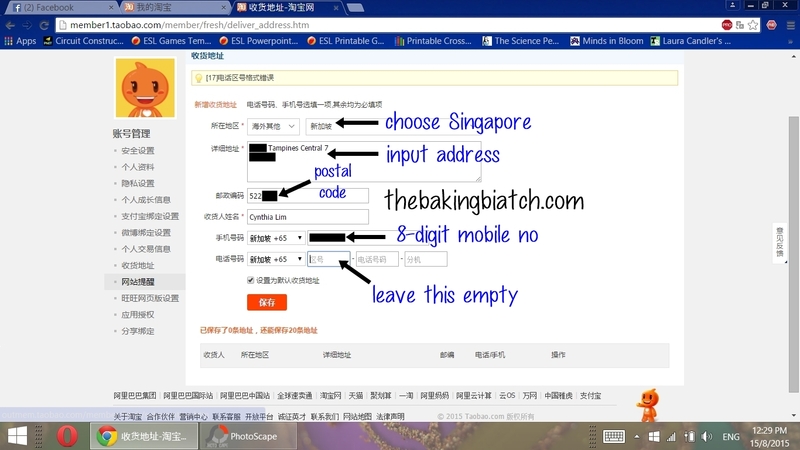 The local courier for 4px is Singpost.. they will drop you an SMS at your registered number on the day delivery is due. You'd also be able to estimate the arrival based on the tracking system..
Add on: For direct shipping, there are pretty strict restrictions on it for size.. if your item is too huge, you may want to use one of the other forwarders.. Generally, I'd only use direct if my estimated shipping via weight is gonna cost more than what direct shipping quotes me. 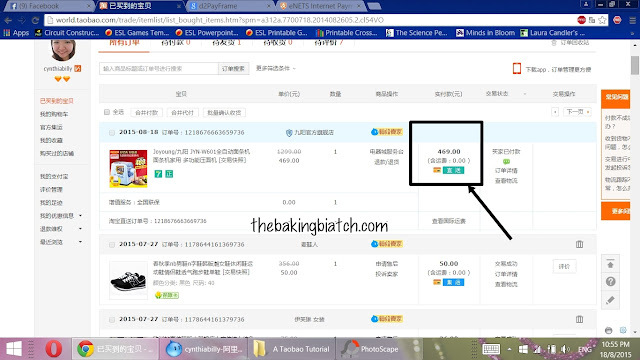 For example, I've shipping in baking tins of about 2.7kg for 40+rmb as compared to 100+rmb via 4px. DO DISCERN upon checkout to determine if you're getting a better deal via direct shipping. In addition, there's a new ruling for 4px that should the volume of a parcel exceeds 3x the weight, the volume would be billed instead of the weight. It happened to me when I tried shipping in a really really light but bulky box of magic sponge. I then re-routed it to peeka to have it shipped via their ship4u service. I prefer air over sea as I do not fancy the wait even though sea shipping is usually cheaper. One can go through agents like Peeka for sea shipping.. This will be great for those who are looking to buying bigger ticket items such as furniture or electronic items. Air shipment has limitations following those adviced by the local customs on imported items. Also, air shipment isn't exactly costly in my opinion. For a consolidate PACKAGE of 10kg, each kg is about $6... A light top will only be about 200g.. $1.20 shipping for a top is pretty acceptable to me! (: Of course, if you're only going to ship a small package of about 1kg, the base charge will make the 1kg cost $10 or so.. So the more you consolidate/pack, the cheaper the PACKAGE gets. Those who have a greater appetite for risks can use independent China forwarders to ship in items via sea.. Such forwarders usually charge by volume, 1 cubic metre for merely 550rmb.. However, I have my reservations about using them.. I was wondering if your trial with the direct shipping and consolidation services has arrived? Other than your blog and review I can hardly find anyone who has explained about this in detail and tried the direct shipping services. I have mine stucked and was wondering if you encounter the same problem as well not recieving your parcel yet? i received my parcel but the experience was okay.. I'm attempting my second parcel with it.. Will update when I have done so..
Hi,I need a help from you. Thanks in advance. 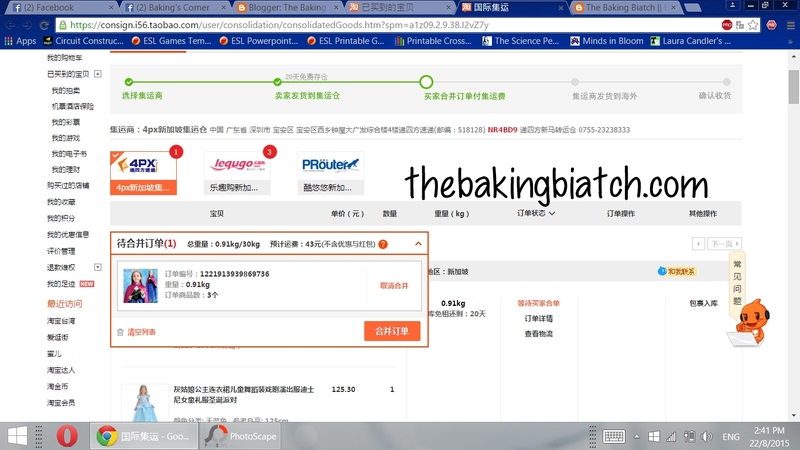 May I know how long does it take after this status for the goods to be received in Singapore using Taobao Direct Delivery? 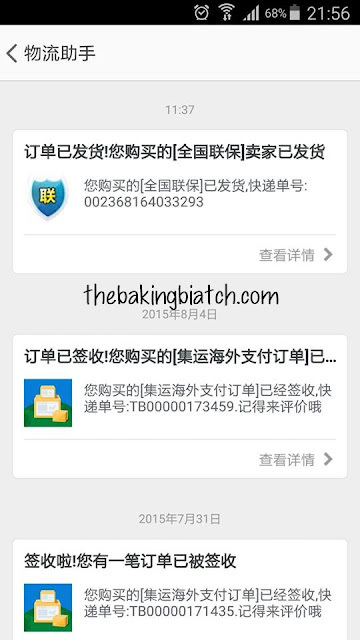 13:39:56 Shenzhen Xixiang 201- international transit warehouse is sending pieces, please keep the phone unblocked Oh! 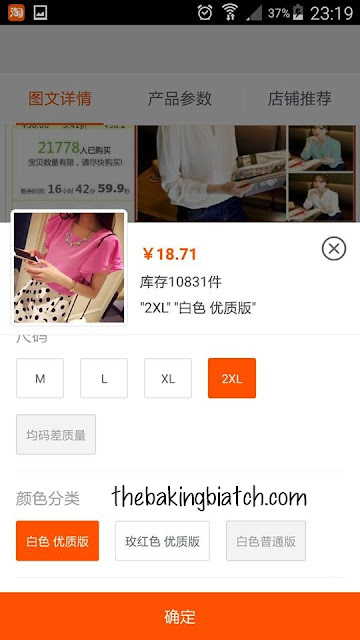 Hi, I thought taobao direct shipping is a new option by taobao that consolidates your orders and send them together? Like a forwarder? Hi, yes it does.. straight from the seller. Hi, your post is very detailed. I wish I could've come across this sooner. I need help. Can I email u privately? Hi i was wondering if i made an order and i decided to add more items, will they be put together at 4px warehouse and ship out together? if you have yet to consolidate your parcel, yes you may order more and consolidate together..
May I understand further on consolidation status? I have bought some items and some sellers has started to send the purchased item to the forwarder but not all seller has done so. Can I purchase some item and engage the same forwarder? 4PX will help to consolidate the newly purchased item with the earlier batch before courier? 20days storage should be counted from when? Hi, i bought an item which costs around SGD$95 plus. However, $189 is deducted from my account. I paid by eNets. Is this normal? I don't know much about eNets transaction. did you check if it's your domestic shipping fees? Hi, how do we alww 4px? and if item is damaged and rejected by 4px , will item goes back to seller or ? thanks! hi, you can alww them via the mobile app or com. if your item is damaged it goes back to seller. seller can resend. 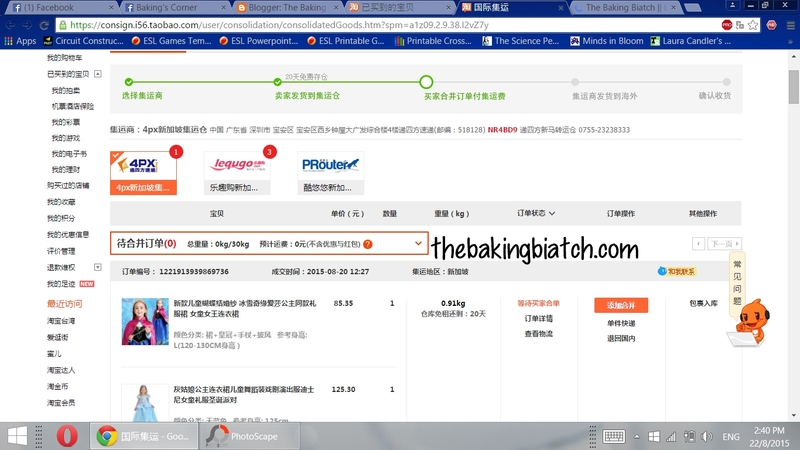 This is the 1st time i'm buying from TaoBao. I buying 4-5items(depending on the shipping fee) from different sellers, will consolidation shipping be cheaper? Is there a way we can estimate the shipping fee? Cause i'm afraid of the unexpected shipping fee. Or do you mind helping me to take a look? Hello, sometimes, consolidate shipping is cheaper while sometimes, direct is cheaper. you can compare when making payment but you'd need to know the rough weight of the parcel. The second payment can be made using same methods. Hi Cynthia, do you know how to set up access to 支付宝? Currently, I tried to set up mine, but they require China's IC number. Singapore's IC was not recognised. hello, the set up instructions are as above (in this post)..
does yours need verification hence the need for ic no? Hi thank you for this detailed guide. What if I not around to receive the package when they deliver, will the desptach contact again? hello, if you're not in, they may re-deliver..
but if you're overseas, it'd be wiser not to arrange for the parcel to be delivered during that period. regarding the eNets payment of $1, is it for per payment transaction regardless of number of items I am paying (as in I could be paying to few Sellers). Is Shipping is another payment transaction? How about fragile / breakable items? Any experience in shipping such items back to Singapore? Will 4px or the agents actually bubble wrapped it before sea/air freight it over? I've shipped them with little issues though of course, there's a risk of breakage. Get your seller to pack the items well. 4px does not check your items/repack them for you. If you use agents' buy for you services then yes, you may have them check and repack it for you. Hello cynthia, does this mean we have to pay for the second time if we use direct shipping? if you use direct, you would have paid for it when you checked out. 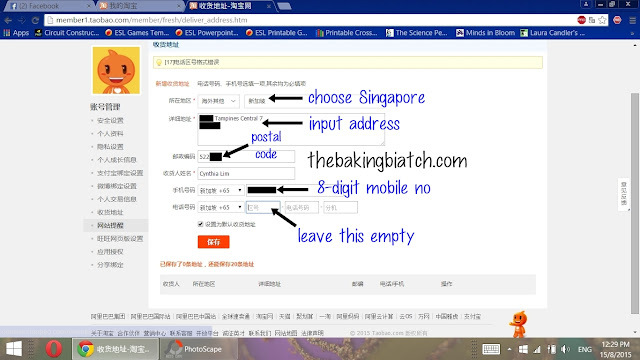 I have given my SG address but they say can't sent to overseas address. Somehow it cannot register it's for consolidation at warehouse? have your set up your account properly? Just wanted to ask, but you see, I ordered an item from taobao excatly a month ago and in the tracking system, it says '12:06:08 [Cargo] your package has been passed through the normal storage Cargo warehouse' on the 17th of october and hasnt moved since. Is it normal for it to be like that? :( I'm quite worried for my item since i need it by december. you may wanna ask your forwarder (else, seller) on the status of the item. mine status is "your package has been passed through the normal storage warehouse Cargo "
eventhough already paid for forwarder shipping charge..how to ask the forwarder? does they use english? i was thinking of ordering a hardcover box set which weights quite a lot. 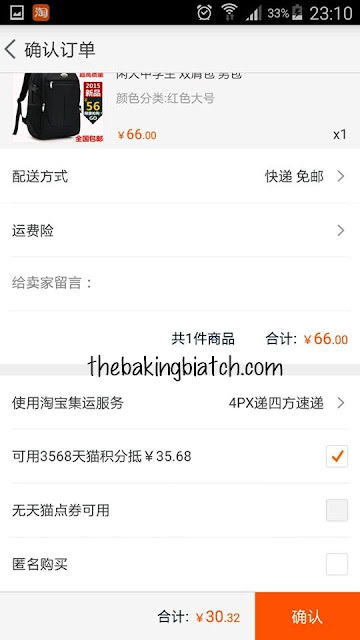 direct shipping is rmb80 and 4PX is about rmb43.. since it is one item, should i just try local shipping? do they use singpost or does it vary according to the seller's preference? There are length restrictions for direct shipping so do check that out.. though I know the direct shipping can be pretty tempting at times cos it maybe cheaper..
4px is not rmb43. it's rmb43 for first kg. 12rmb for subsequen 500g. no, some sellers don't. General rule of thumb is if you are able to check it out with your settings all right, then yes, you may ship it. 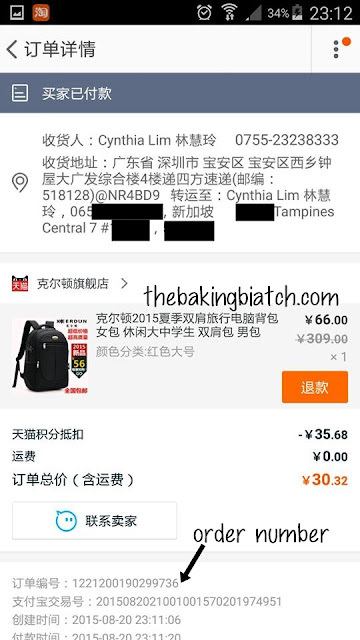 Hi Cynthia, it's my first time using Taobao's direct shipping to Singapore. Do you happen to know how I should get the tracking number to track my parcel from China warehouse to Singapore? I've ordered items from the 11.11 sale but have no news on the delivery of my parcel. Thank you in advanced! hello, the details are all online in your account. The 11.11 sales were insane and resulted in a fair bit of back log.. This is especially so for those using direct. Contact the company (ZTO) and check with them on the status if you'd like. May i know where is under to check for the shipping no.? And how do you contact ZTO? I am facing serious trouble as only some of my stuff are delivered. I am extremely lost and do not even know who to go to. Thanks so much. hi, items are sent to the warehouse and once it's all ready, it'll be shipped to sg. You may have to wait a fair while.. I think direct shipping is experiencing some issues/delay due to back log from 11.11 sales. But I just want to check, the address that the sellers see basically isn't my address correct? If it is set up correctly, they will see your forwarder's address. If I make a payment through enets, the refund will be at my e-wallet or be made to my bank account? Where can the 支付宝 be found? Is there any way I can credit it to my bank account? Thank you! Thanks for the awesome guide and it helped me thru my very first order. 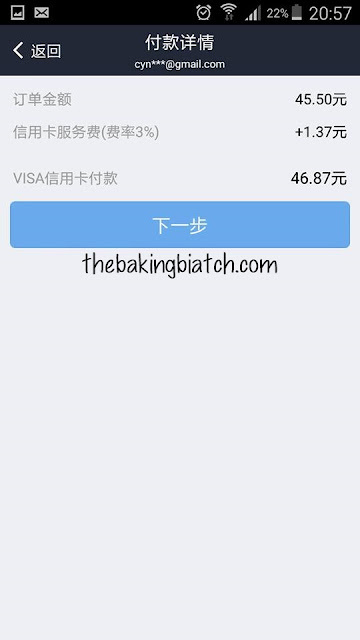 However I have 1 transaction where the status is 交易关闭 after I paid via enets. The seller said there's technical glitch and they didn't receive any payment also. I've checked alipay and no refund made there as well. Any idea what I should do? hello! to consolidate, click to add to cart (as in tutorial) and pay as per the way you'd do to an order. Hi Cynthia, have you encountered any issue with items missing from your consolidated parcel? I just received my direct shipping parcel and half my parcel is missing..
hello, no i havent. you may want to alww ZTO (company for direct shipping) to check with them. Have you experience missing items in the consolidated package when received? this will be the first time im using taobao and your information is really helpful! However, Im intending to get a chocolate fountain machine on taobao. Do you recommend buying electronic appliances from the site? Chance upon your articles on TB shopping. In fact you could delete/remove items from your shoppibg cart. Yes I realised so! Thanks for sharing! I've updated it! After i enter my credit card number, i will see 2 options - DBS or Visa. Do you know what the DBS option is for? Will i save on the 3% cc charges if i choose that? Hi, can i check with you do you have the prefer size Conversion Charts for all things? Example this url for the females/males shoes,coat, jacket , tshirt , tops and suits? 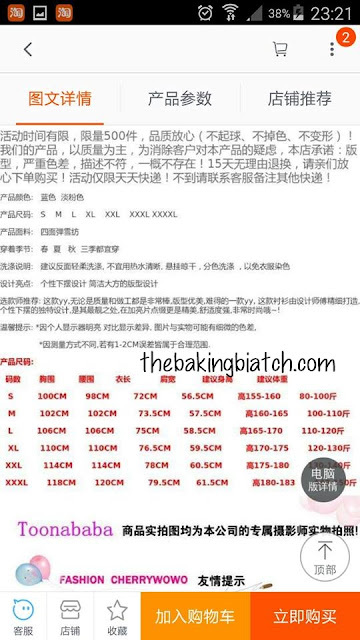 Hi, I refer to the size chart of the item I buy. It's useless referring to such charts cos it's not universal for all TB sellers. Hello! I just recently purchased from Taobao (I'm in America and an American), and I need help. So I put in my order to Taobao and the items were received at the warehouse but I haven't gotten any photos (am I supposed to if it's just to the warehouse?) or new info in the last two days. 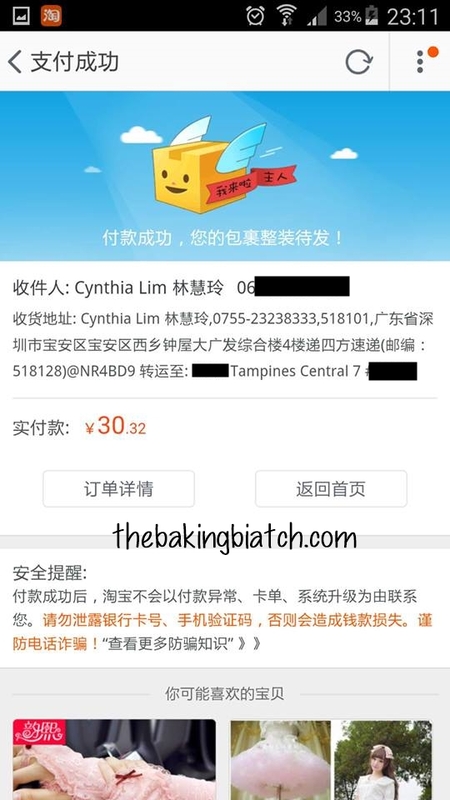 The last thing that happened says: 10:26:01 [Chinese]  Zhongshan City, Guangdong Province, Zhongshan City, Huang Po faction member Members: Wu Wenyu 13326920034 is for you to send pieces 14:10:06 [Cargo] sign for your package has been Zhongshan, Guangdong Express Cargo compartment. from two days ago, but I don't know what to do, am I supposed to click a button, wait, or send my payment to the warehouse? If so, where do I go and what do I do? I don't think you will get any photos. If you are worried about your goods being damaged,use an agent next time so they can check the goods on your behalf. When your parcel arrives at the warehouse, it takes time(1~2days) for them to weigh your items before it's updated in the system. When they are done, you will see the weight,the price you're supposed to pay, and a orange button which u can click to go through the payment process. The goods will be shipped after that. hi, thanks for the detailed explanation. I would like to know how long does it takes for a package (just one order) to arrive in Singapore? Is this by air or by sea if I were to choose TB Global direct shipping? The same logic applies. It depends on how long your seller takes to dispatch the item, how long it takes to get to warehouse, how long warehouse takes to dispatch and if there's delays at customs etc. Tb direct is by air. Hi, thanks for sharing the above information. I would like to know what does it mean by "Your goods are customs clearance, waiting for release". I've selected TB Global direct shipping anyway. it is pretty much what it says.. it's pending custom clearance.. once it's cleared, items will get to you. Hi Cynthia, I wanted to find out from you. For TaoBao Direct Shipping, I understand that there is a size limitation of L cannot exceed 80cm, and L+B+H cannot exceed 120cm. As I am planning to get a few items at one go, do you know if the size limitation is measured based on ONE item or they will add up all the items and measure? wow! 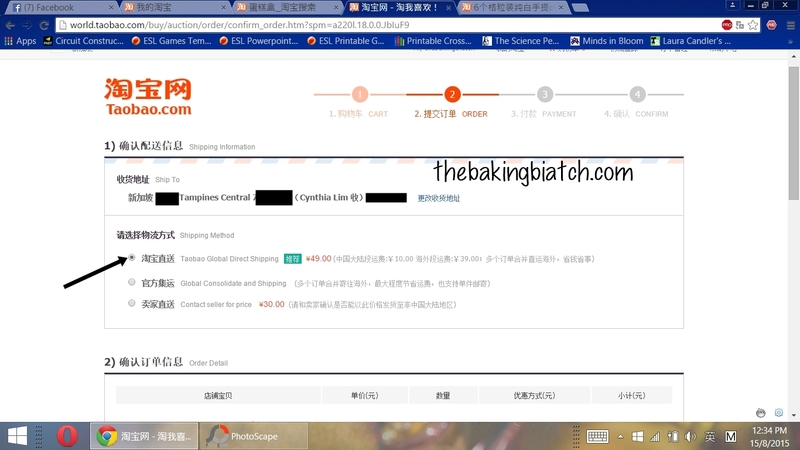 your blog is full of details which helps me a lot in my first time purchase from TB ;). may i ask if we're unable to contact the seller (offline) to send out our items or seller takes too long to send out items (don't want to miss the free 20 days period), can i ask for refund? can i click on the consolidate package for those item already in the warehouse and some is still on the way to check on the total weight or i can only click it when all items already reach the warehouse? Yes you can ask for a refund. You can only consolidate everything when all of the items are in the warehouse. I've already ask for refund and waited for 20 days for the refund to be credited but I can't see where the money is. As far as I know it will be credited into Alipay account. 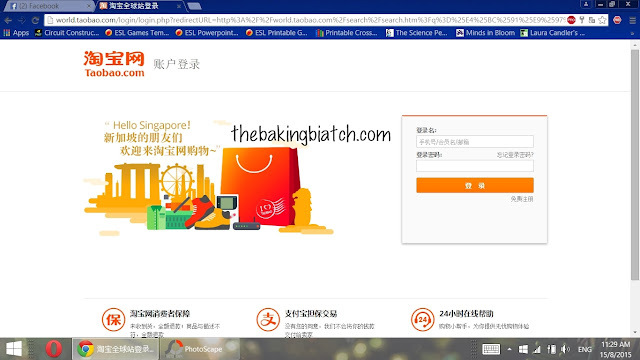 How can we cash out from Alipay? 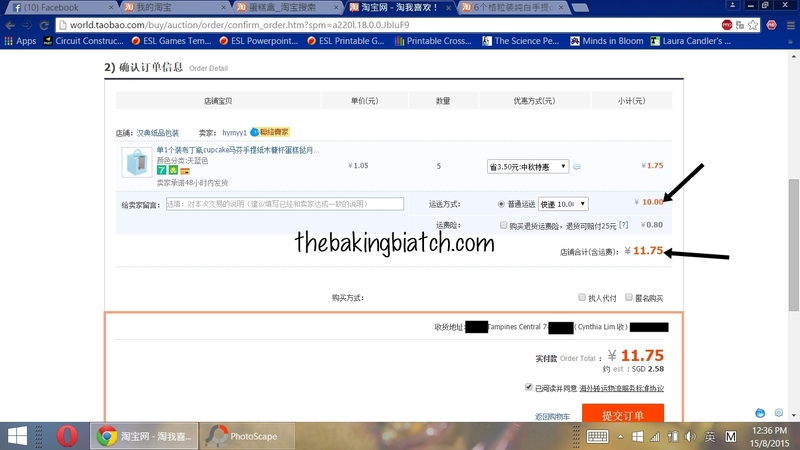 Do you have any idea on how to get back refund from Alipay? Hi Cynthia, I ordered one item for direct global shipping, this is the message I got, what should I do? It say forwarded refused to ship the package? I am not very good in my chinese, what should I do in this case? Thanks for your time. Really need help. You'd have to request for item to be brought back to seller and seek a refund. You'd probably have to bear the domestic shipping fees (both to and fro) or not have to pay..
You'd have to discuss it with the seller. Alww them. Hi! I have a question about shipping. So do we pay for shipping to the warehouse and then international (so twice)? I'm worried about buying from different sellers and paying for a ton of shipping fees. Hi, I'm not sure if you've read the post even before asking this question.. Shipping to warehouse is DOMESTIC shipping. Is there any good shop to buy for chinese new year those can wear de. 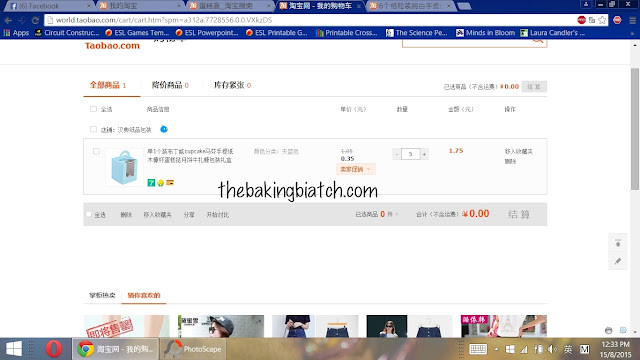 erm.. all the clothes off taobao can be worn.. and whether it's your style or not is up to you.. I'm thinking of buying baking stuff, etc baking tray, cake cutter (round/triangle shape) & empty containers. Am I allow to air shipping these items? yes you should be able to do so.. There are prohibited items that our customs disallow.. please check with the site to see what can and what can't be shipped in. Hi Cynthia, thanks for the useful guide! Can you advise how one can tell how many days there are left for an item to be stored in the warehouse please? you can view the no of days left where you consolidate your items. 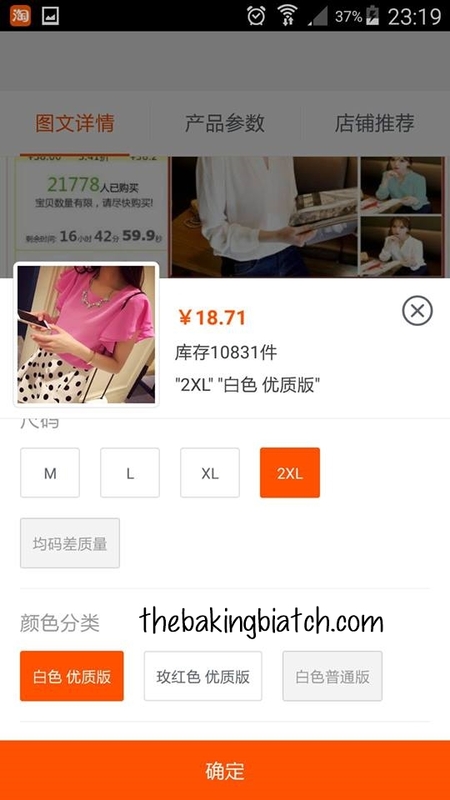 hey cynthia, pls help....my wife bought some items from taobao using global direct shipping. 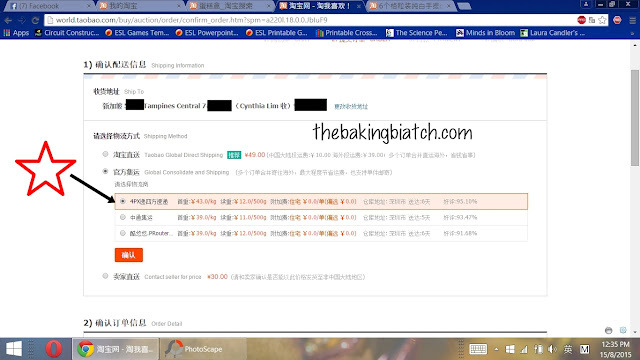 current status shown "您的包裹已被中通集运仓正常入库", how long more does she need to wait for items to be ship to our house directly? Please have her check with the shipping company, ZTO for the details. She may alww them. I have order few items from diff suppliers. 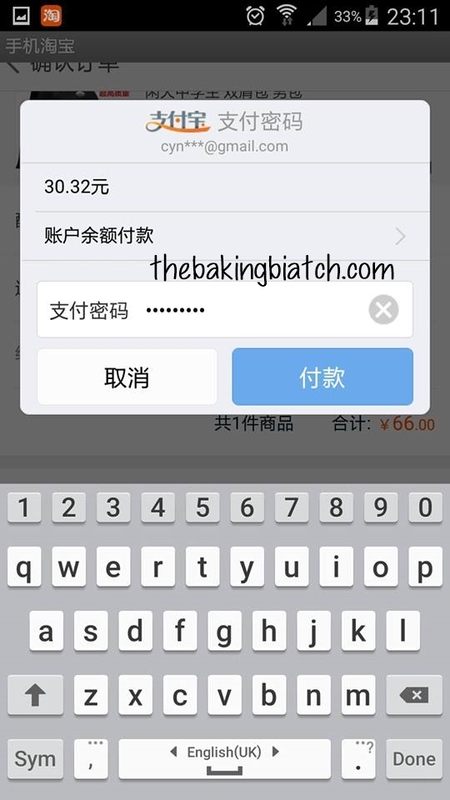 It stated 支付转运费 (还剩9天3时) for one of the item. What should I do about it? Pay or wait for others? If more than 9 days, will they cancel my items? The countdown timer if for release of payment to sellers. have your items reached the warehouse? If no, you won't see the blue button. Thanks for your detailed taobao guide. I have some questions here. What does it mean by 支付转运费 还剩4天1时 ? Does it mean I have to pay within 4 days? I thought I have 20 days free to keep my stuffs in the warehouse before I consolidate all stuffs and pay for delivery? it means that payment will be released to seller within the 3 days. Yes you have 20 days of storage. How do you know if they do send to Singapore as in overseas shipping? If I am using the app, will it indicate ? "物流状态已签收” - 快件已签收. but the address is not my home address, it's some 深圳市,is this normal? or i wasted my money shipped to wrong place? Have you chosen any of the forwarders? If so, the address that is visible to the seller won't be yours but the forwarder's. eh....i dont know how to check leh...but hor...the final destination is my address la. Erm, click on the consolidation page (using com) to see if your forwarder (if you chose any) is expecting your parcel. And if it is at your forwarder's, you can pay for shipping. I opted for Taobao direct shipping for my items and it was rejected by Zhong Tong shipping due to the parcel size. I was told to opt for refund by the seller. From what i understand, the item cost fees be refund fully but how about the international shipping fees that have been paid in advance? are we able to get refund for that too? 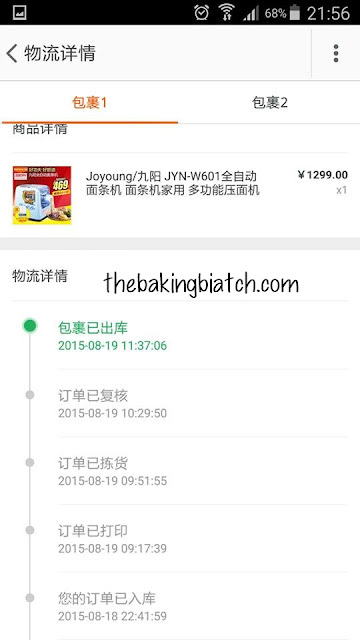 do approach ZTO shipping regarding the refund. i have opted for Taobao Direct shipping method and my items was rejected due to the parcel size. therefore if i opt for refund, will i be able to get back the international shipping fees that has alrdy been pay in advance?? Drop ZTO a message via alww and explain your situation to them with screenshots of your cancelled transaction. They will do the refund accordingly. I know that the money will automatically be credited to the seller after 10 days . *My question will be what if the money credit to the seller after 10 days and we still yet receive the stock yet , what can we do ? there's nothing much you can do since the duration we take to receive the parcel is more often than not, 10 days or more. You can extend it for 2/3 days but to me it doesn't make much of a difference. Which option do you recommend people to use? Option 1 or Option 2 for delivery? Please READ the entry again. Hi Cynthia, thanks so much for sharing this extremely detailed post!!! I'm wondering in your experience of buying from taobao if its 'safe' to buy now nearing the CNY period considering factories will be closed and shipping will be delayed? You reckon that I would get my items >2 weeks later? Thanks in advance!! it's my pleasure (: No, it is not a good time to buy now. You may wanna start doing so 1-2 weeks after CNY. Thanks for this tutorial! It has helped me a lot. I got through everything alright and right now it is going overseas (to the USA). I can't seem to find the tracking number for overseas. hello, use the app to find your tracking details.. it's the easiest way. Thanks for the detailed description it sure sounds complicated!! 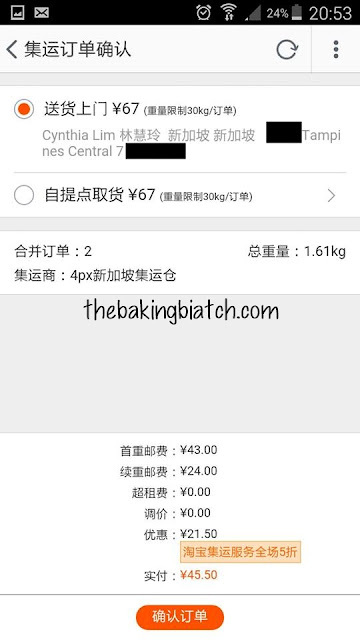 Btw, you mentioned you paid $38 SGD for shipping alone for the first option of direct shipping, but in the screenshot it says 171 Yuan - isnt that about $6 SGD? Does it mean its $6 or $38? Is there a charge which we wont know about? 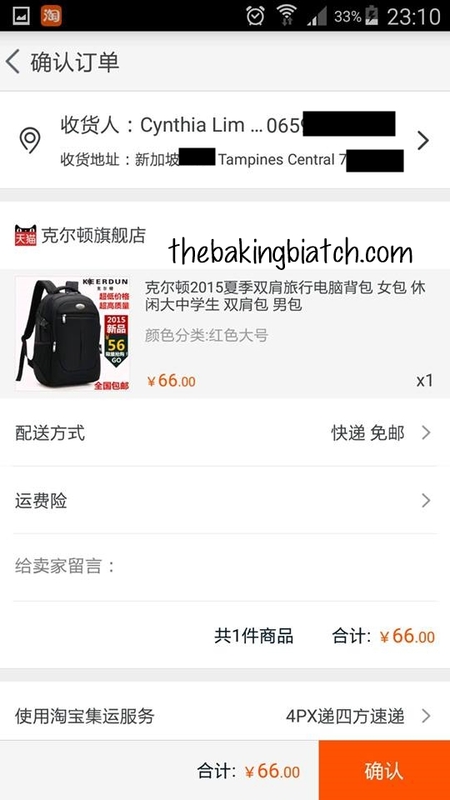 171 yuan is $38 leh. exchange rate was about 4.5 then. Hey! I made the mistake of ordering on Taobao just before CNY, I'm wondering how long the delays would be until I get my items since I assume the postal service resumes work on the 15th? Is there any possibility I can get them before March begins? Thank you! I'm not sure if you'd get them before March. It'll greatly depend on many factors like if the sellers are working/if they'd send out etc. Hello Cynthia! Thanks alot for the detailed guide it was really useful. Can i check with you though, if i use direct shipping does it mean that I can skip the step of consolidating and all, and just wait for my item to arrive at my place? it's my pleasure. Yes it is. I have recently purchased 4 items from taobao using 4px, i have already paid the shipping fee but why is it that i don't receive any notification about my items? 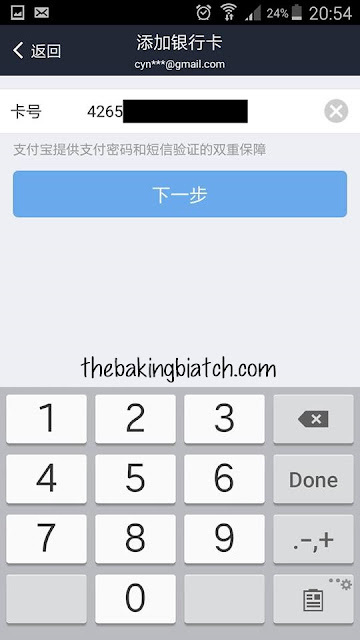 And that it say 淘宝订单号(number) 已入库，请及时登录淘宝账户支付国际转运费. So i'm kind of confused.. Sometimes, the tracking is under 1 item alone. Check all your items. My first time to make a purchase from Taobao and I chose the option one ( Which is direct shipping from seller ).It said the item has arrived in Cargo Warehouse since 2 Feb but I just wonder if my parcel will be shipped direct to my address or do I need to collect at the Singapore Warehouse.I am so confuse and it quite difficult for me to read Chinese :( So sad.Can someone advise on this.Thank you. it will go straight to you. My name is Pat and this is my first time to make a purchase from Taobao.Unfortunately,I have chose the option one which is shipping direct from seller and showing on my account that the parcel has arrived at Cargo Warehouse since 2 Feb.However,when I click on the order status it Shows as below. So,I wonder if the parcel has already reached in Singapore or still with Cargo Warehouse? and if the parcel arrived,Do I need to collect it or it will be shipped to my address. 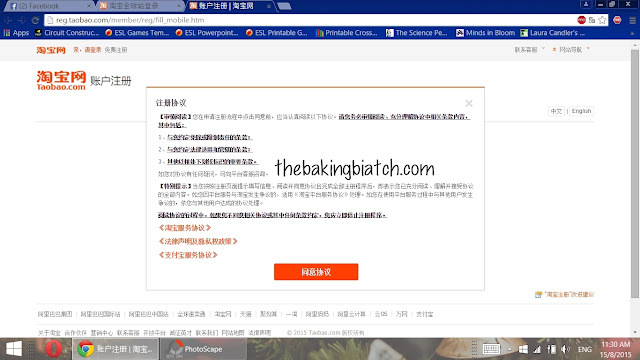 Please advise me :( I am so confuse in the process and it is so difficult for me to read Chinese. the tracking is likely for the China side. I'm not sure if the warehouse side has sent your items. You can ALWW ZTO (search for them on tb) and ask them for the status. However, do note that it's still CNY holidays for them so they may or may not be back in operation yet. I am in the USA... 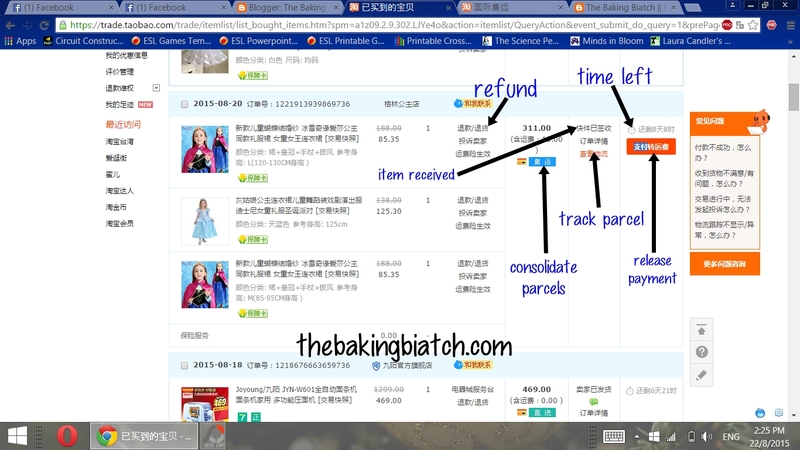 I have ordered from taobao before and have had items direct shipped. This is my first order for consolidated cargo shipping. Can I consolidate and pay for shipping with only 1 order? Or do I have to have 2 orders to get my item shipped out from the cargo warehouse? I ordered 2 items from the same seller and they shipped it in 1 package to the taobao cargo warehouse. I want to receive my order as soon as possible and I don't have any other order that I want to add. You can consolidate up to 20 parcels at once. If that's the only package you have then you can consolidate it and have it shipped out. Hi Cynthia. Thanks for your helpful post. 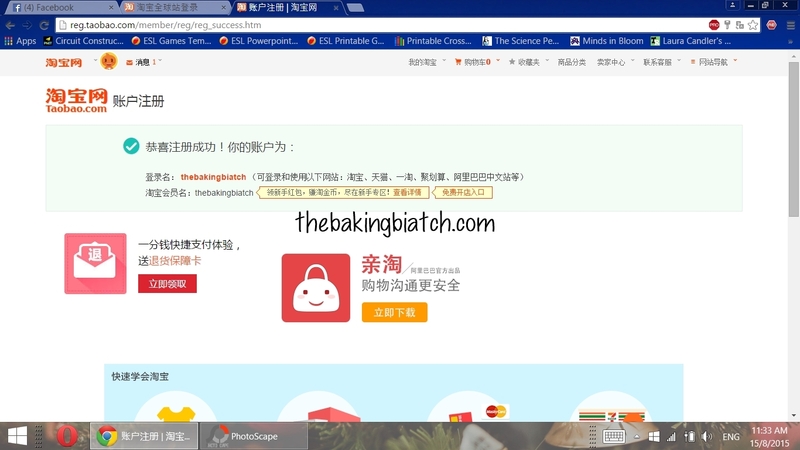 Re taobao shopping, I've made eNets payment in the past. This time the option didn't appear when I checked out & pay. 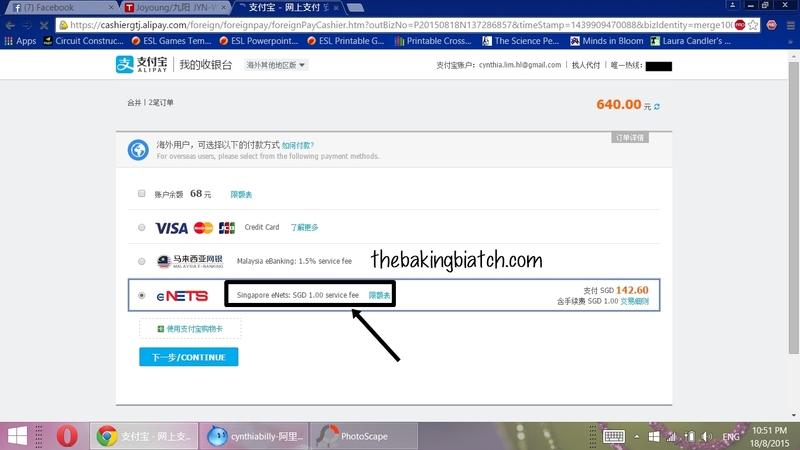 It goes to 支付宝 I tried using my credit card, it says this card cannot be used. Wonder why? Do I have to link my card to 支付宝 first? Will appreciate if you can advise. Thanks. I don't think you have to link the card. Try paying for your items via your mobile app. That's what I usually do. If I'm hardworking enough to use the com, I'd just used enets. A insightful and helpful post! Thanks alot! I'm intending to buy furniture from tb, saw that you bought furniture before. What was the range of shipping fee you paid for them? Hi, I got mine through Peeka Buy4U services. It was billed by volume. I paid bout 800 for my entire dining set. Don't have the exact details anymore. Your shipping fee will depend on the company and service you choose. Hi, I just make a payment on my items. May i know where can i download the invoice? there is no invoice (other than your banking transaction). Hey Cynthia! Thanks for this detailed blog post. Really helped me a lot. I followed your guide and order some stuff from taobao and used their direct delivery but have not received my orders. Its been almost 2 months already! Should i contact tao bao or should i wait a little longer as i ordered my stuff just before cny. You should have received your items by now.. You may wanna give the local tb office a call. Thanks for the detailed blog! This is the best I read so far. there are still a lil things I am confused about. It's my first purchase and I am still confused about the shipping and i hope you can help. I read many blog suggest to use the second option consolidate cargo shipping (with 4px) as it is cheaper and more reliable. But when i am in the option it reads "1KG or less = RMB35" which wouldn't it in the end more expensive than the direct shipping? All my items combined (2 items only) should be about 3kg.. if i do decide the consolidate cargo shipping does it mean I will have to pay more? Here is the part I am pretty confused about. I cant seems to gauge what is the second shipment cost like.. is there a way we can see from the page or we have to calculate ourselves? And if direct shipping means I only make 1 time payment right? And how do I know if i need to pay extra from province to warehouse? one of my item cost is RMB 38 and then on another hand, it shows RMB38 province fees for this item but not the other. Do you know what this means? My Chinese is very limited.. and i am just using google translate for all the procedure so far. Thank you in advance. Thanks for replying. Much appreciated it. I decided to try out direct shipping but when select all items and click "confirm" for all the selected products, i was directed to Alipay which then display a message something like "Payment cannot be made together and must be made separately". Can you also teach me on how to use Taojinbi for discount? Is the discount is only applicable using mobile app? The money goes into Alipay. You can't cash out the money but you can use the balance when you check out via the com for your next payment. I'm not too sure bout taojinbi though. I don't usually bother. Hi! This blog post is so detailed and informative! I've been Taobao shopping from the United States since 2014 and I've been addicted to it ever since. I find it almost impossible to buy from Taobao myself as I cannot talk to the sellers about the pre-order items I buy. I normally use an agent and I've been using Buynosaur recently, they're amazing! 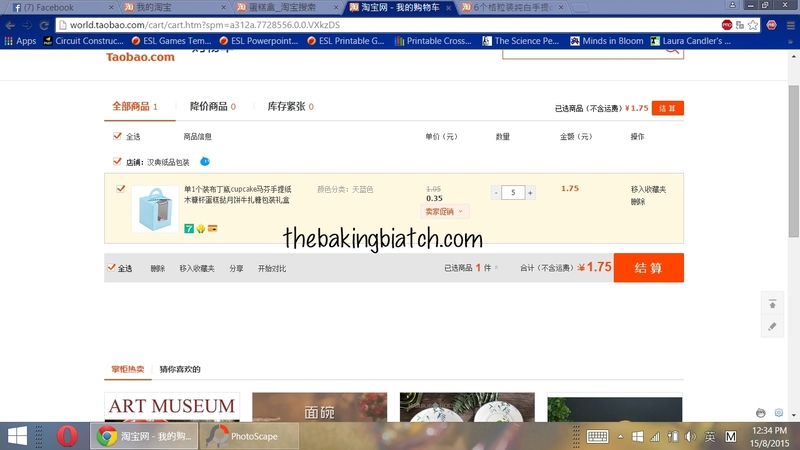 My question is, are there any sellers on Taobao that speaks fluent English? I don't mind using Buynosaur but it will be great if I could try Taobao-ing myself! 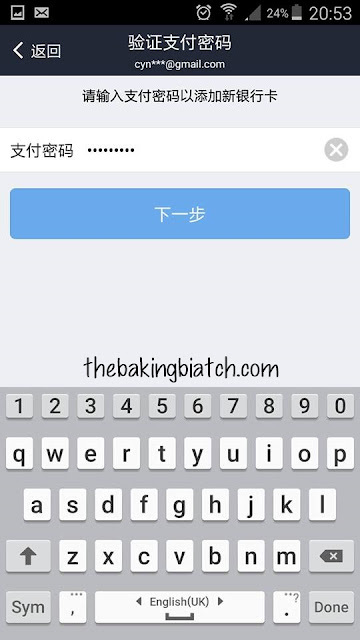 You can try using google translate to get mandarin translations for you. I doubt there are any fluent English speaking/reading/writing China Chinese sellers.. You could do bits and pieces conversations with them though! Hi Cynthia, your tutorial did helps a lot, however, i did checked with few buyer if they are able to deliver to 4PX or DPEX or DEX, they will just reply no, they don do any delivery to these warehouse. Is there a lot of the seller unable to deliver to those warehouse? you don't have to ask (they won't know). if your settings are right, the parcels will go to the right warehouses with the pre-set addresses. Hi Cynthia, thanks for your tutorial, it did helps a lot. As i require consolidate shipment, i did check with some of the buyer whether do they deliver to 秀驿物流DPEX or 4PX, or 递壹时DEX or 酷悠悠.PRouter海外. But all of them rejected to deliver to these warehouse and informed me that they do not deliver to all these warehouse. 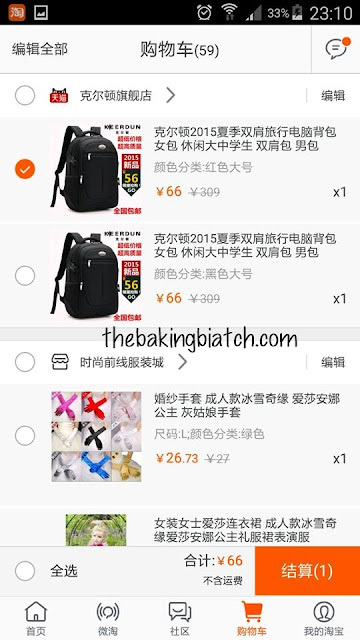 But how come taobao enable to select either of these warehouse? Hello! My item that was purchased a week ago is still on the way to the warehouse, while my other items purchased already reached. Should i continue to wait? If not, who can i contact for help? No. I don't think I'd be comfortable doing so either. 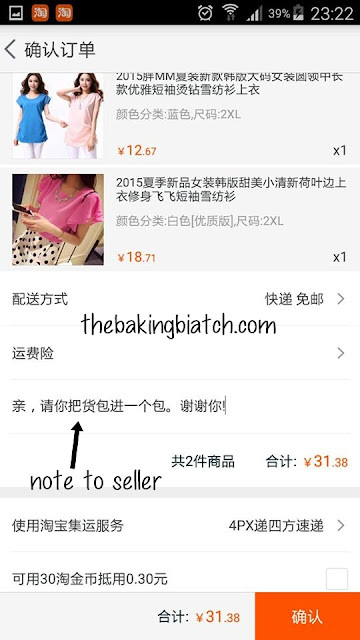 该宝贝不支持当前运送方式，请选择使用其他运送方式 on the item description i guess. it could be that the item is not available for shipping/your method of purchase. You may try 3rd party forwarders if you really want it. Personally, I do not like 65dg.. Peeka would be my preferred choice. But do do your research. Many people do use indp forwarders to bring in their furniture.. but there's a risk involved.. 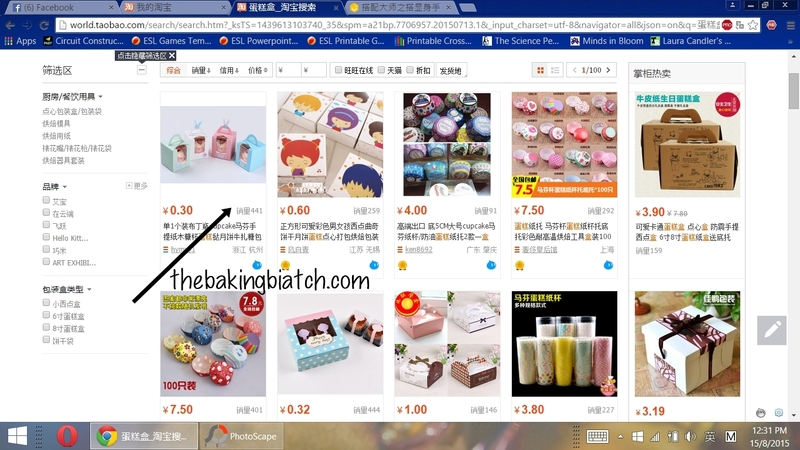 Sorry, newbie on Taobao. Do you need to register for 4px account first before choosing them as forwarder? I don't think so.. unless seller has not sent it out then you may negotiate for seller to cancel order and you re-order and send it to forwarder. I have just make a payment for my first order. But I dont get what you posted on your blog.I didn't have the option to choose international freight shipping. Will it ship directly to my address in Singapore? Or I have to wait for every orders to confirm than I can consodilate the items and than opt for a forwarder? I heard from my friends that some order I have to pay second payment. Some don't need. How do I judge from this. ? Please read the entry thoroughly to find out the options available. I have paid for a good 1.1m long but the seller said the warehouse cannot ship out this length.Seller ask me to change warehouse,can i have your advice how to do it? First time order. Has the item been sent to the warehouse? Or is it seller that says that warehouse won't receive item? Or is it that the warehouse has rejected the item? Hello. Have your items even reached the warehouse??? I've just refunded all my goods as the seller told met that I didn't choose the 'agent' to put my goods there.In other words,I just direct the seller to deliver the items to my singapore address. Hello Cynthia, thank you for your detailed post. I am new to taobao and can I ask you something regarding payment with eNETs? The payment page did not allow me to choose to pay using eNETs, only prompt me to pay by credit card? 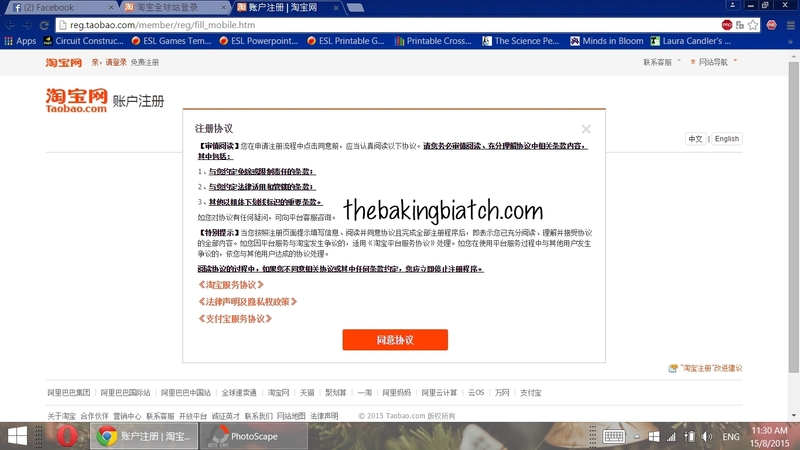 I have talked to taobao customer service, but they told me need to do verify my Alipay account first. 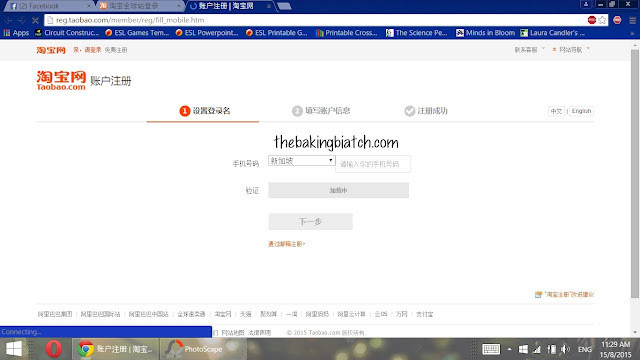 But I cant proceed as it ask me for china bank account. 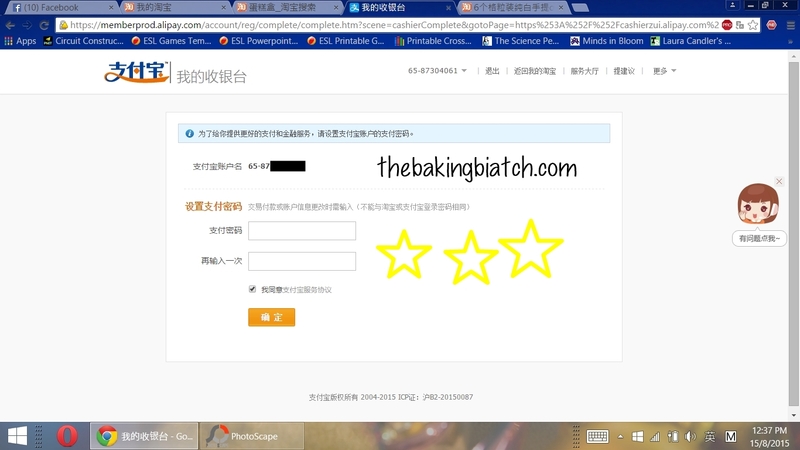 I think it's a new measure by taobao that requires verification lately. 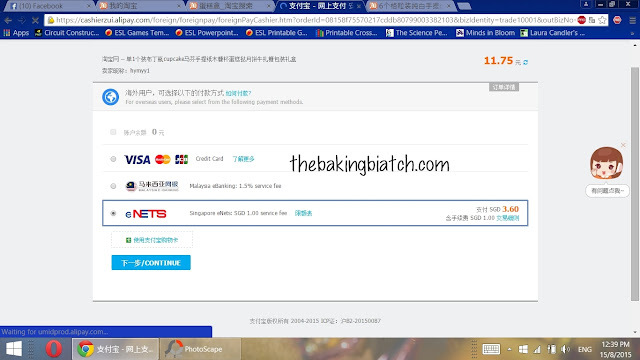 May I know do I need to verify Alipay account if I want to pay with eNETs? As my payment page only prompt me to use credit card. 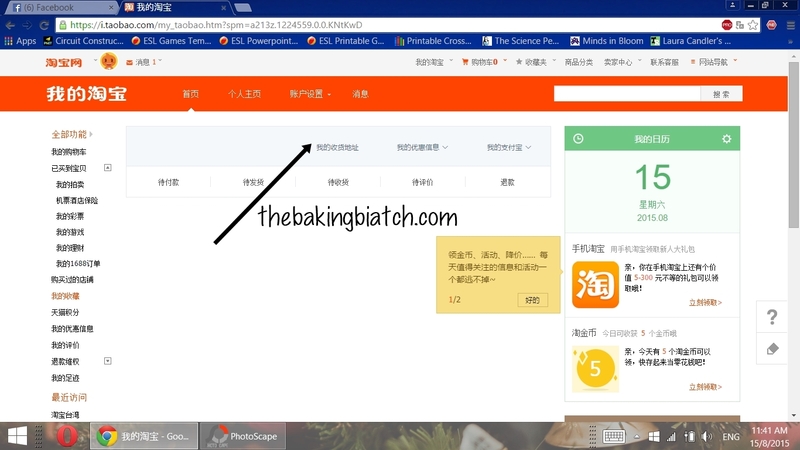 I talk with taobao customer service, they told me need to verify Alipay account first. But to verify alipay, I am prompted to provide china bank account which I dont have. 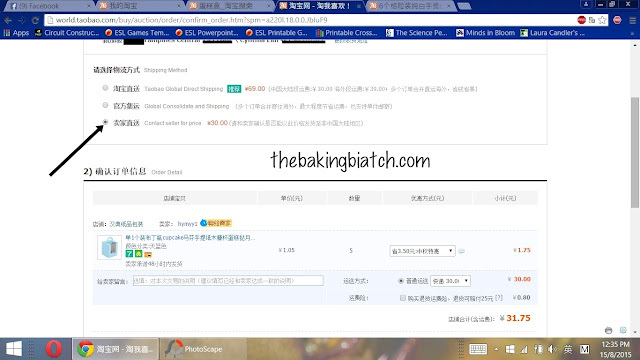 i used global direct shipping and has an item refunded and the credits are in my Alipay. Any idea how I can get the credits back to bank account instead? I don't think you can do that. You may want to use it for your next payment and you may wanna use it soon cos the funds will be frozen with the new measures rolled out by taobao. I received an item from a TMAll seller that was wrong. I talked to the shop through AliWangWang and they require me to send back item to them and tell them the tracking details before they can refund me. I have already applied for refund and its approved. I'm from Singapore and am having some problems with my payment. At the Alipay payment page, the only payment option I am given is to pay by Alipay purchase cards (使用支付宝购物卡) even though I have set it to overseas . Is there any way I can change it so that I pay by eNets? Thank you! I use Global Direct Shipping and all my items arrived at warehouse. It already 2 day and my items status still "In library" or in storage something like that. What should I do now? Hi Cynthia! 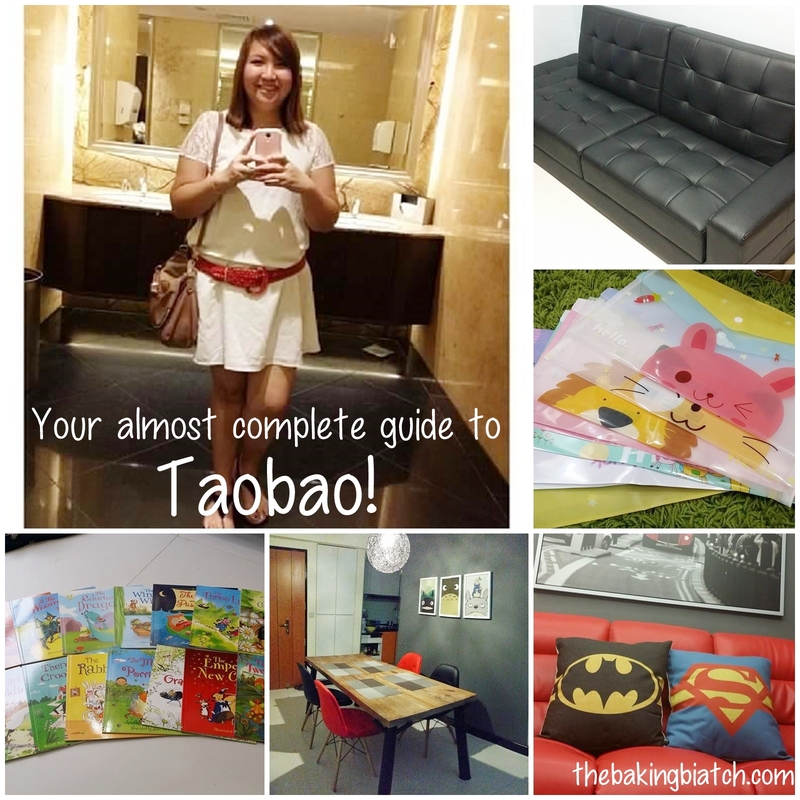 I write TaoBao guide, share my buying experiences and what I bought from Taobao on my blog too! You wrote such a detailed guide! You are doing a great job! Awesome! 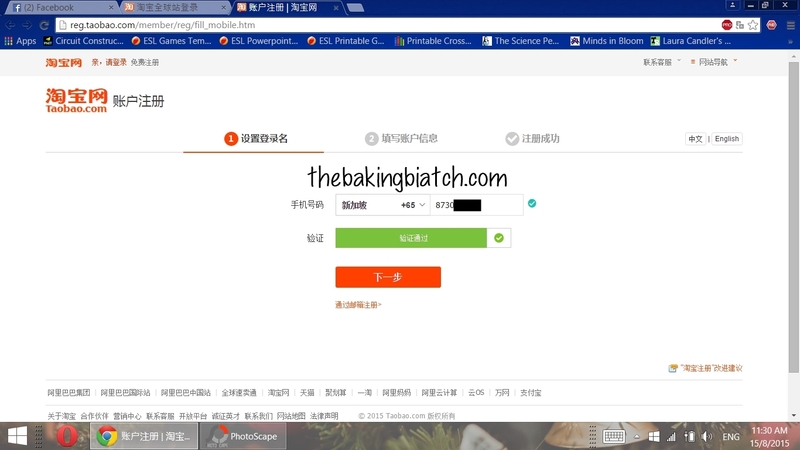 Just want to say that when using a mail forwarder, do not use this company 65Daigou or Ezbuy, they have recently changed their names. I ordered a shipment of makeup and when it was delivered to me, everything in the box was smashed to pieces. I took pictures of the box and contacted the company but they claimed that as i did not reject the box at the point of collection, they are not responsible for anything. How would i know the items are damaged inside?? They refused to even refund the shipping fee even though they admit it was damaged during international shipping. This kind of company cannot be trusted. They also have other dirty tricks in their pricing, by charging 1.1 times of the actual product weight, and sometimes they take this so-called volume weight when the item is sent in a big box. Always deal with a company that is responsible for damages, because it's very easy to get things damaged during international shipping. I selected Direct shipping for my items but they were rejected at the warehouse because too large. Can you help guide me where and how to request for refund? Both from the seller and for the shipping fees? Hi Cynthia, thank you for providing such a detailed guide. I'm a new buyer and planning to buy from Taobao via their global direct shipping. However I would like to know will they repack the items or they just pop the entire parcel (without unwrapping the seller's packaging box) into another box and post it out? 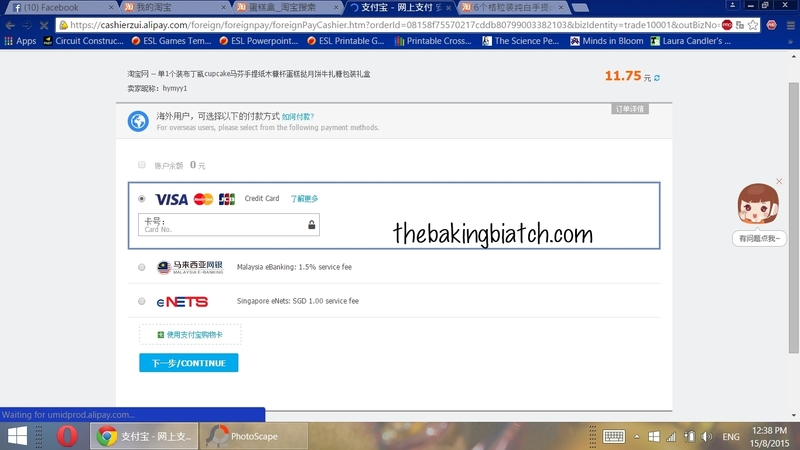 Hello, I chanced upon your blog to understand how to use TB shopping before I check out my cart of items. I got lost after the items sent to the forwarder. So does it mean that I should do a direct shipping after the items have been consolidated? Or I can still do the 2nd option for the 2nd payment? Also, the 2nd payment u have chose a CC payment but u recommended to use eNETS. Can I stick with eNETS throughout for both payments (forwarder as well as the direct shipping)? Hi Cynthia, I chose tb direct shipment. One of the seller request for me to refund as he does not have the stock. What about my shipment cost? I'm sure that item does affect the shipping cost. Any idea how can I escalate this? May I know how does refunding into alipay work? 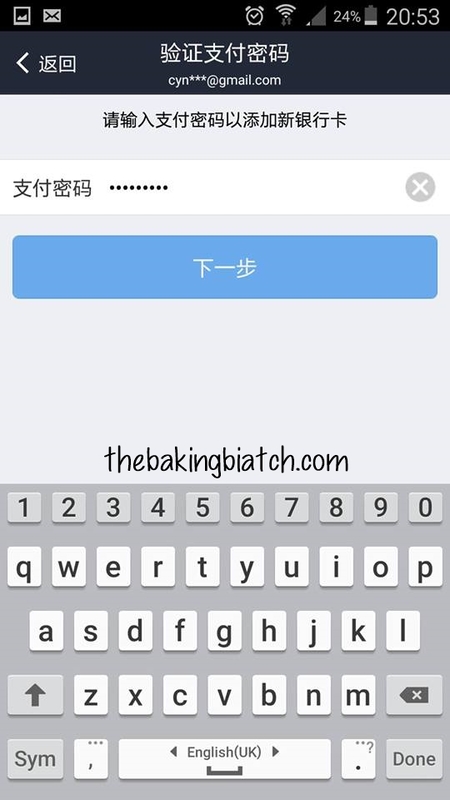 Sellers are telling me they can't credit into my account because I'm not verified..but when alipay prompted me to enter card details it keeps saying error :( how did you manage to get yours done? I managed to google your guide on Taobao shipment. I try to order some stuff from their site and choose ship direct to Singapore. 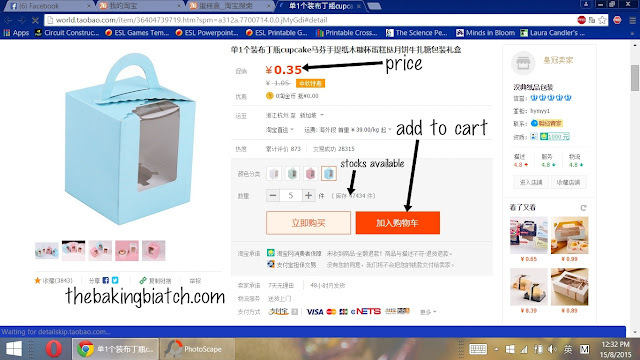 - 1st Seller - their promotion price RMB 88 and at checkout i choose ship direct. (correct?). - 2nd seller - RMB 58 and checkout i select same ship direct. At Checkout, their is shipping fee of RMB 39. Is that all I have to pay, as I doubt it is so cheap on shipping charges? It's not like Amazon where they automatic add international shipping charges. What do i need to choose so that the international shipping fee is included?. Cynthia, this is awesome! I love buying from taobao and have always found it a bit challenging to understand as I do not speak Chinese.I bought a pair of shoes yesterday that said " free domestic shipping", and chose direct shipping. However, there was nothing that prompted me to pay for shipping. Where/ how can I pay for shipping to my house in the United States? Hi Cynthia, I got all the way to inputting my cc number but when it came to the final submit it keeps stating there's an error. Could this be coz of my alipay verification? 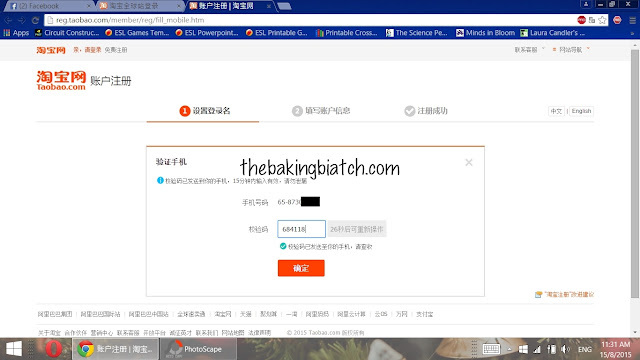 Or is my alipay verification ok since I got to the credit card details page. Thanks much! Hi,I am from Malaysia,can i ask you,how can I find my items tracking number? Hi Cynthia! Thanks for such a detailed write up, esp on direct shipping! I tried the direct shipping for picture frames and it's roughly 3.6 kg so I topped up with some stuff. Now the other items have arrived and the picture frames are nowhere in sight! 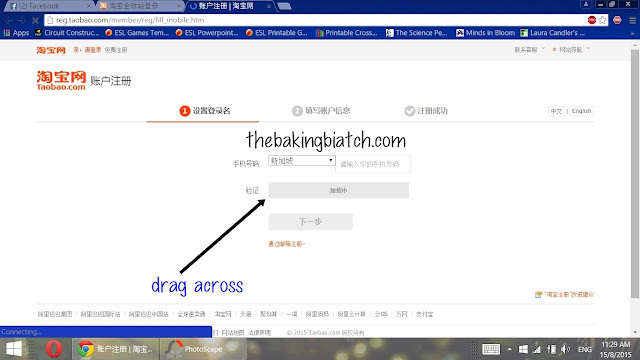 Do you know who I contact at taobao direct shipping? I tried the bee thingy but it doesn't have answers for it. Thanks and have a nice day!